It seems quite fitting (at least in the states) that “bursting with light” is the theme for July as we usually celebrate our independence (4th of July) with fireworks. They light up the sky with bright colors, explosions and beautiful starbursts and flares. This mandala focuses on more than just fireworks in the sky…it’s about the fireworks in our hearts and souls. It’s that part of us that we all, to some degree, hide from the rest of the world for any number of reasons, with fear being at the core. “Bursting with Light” encourages us to let our light shine…and more than just by a little. We only need a small spark on which to grow and shine light on our true, authentic self. This movie offers a metaphor for our lives…are we making our own choices or letting others decide for us, consciously or unconsciously? Are we letting our fear of what others say/think, hide our light? The time has come for us to come forward, bursting with light, letting our true selves, our true natures shine forth. Also…be sure to check out Section 7 of the Mandala of the Year. Nice mandala! I like beautiful bubbles of color emerging from a tiny point of consciousness. I like your inspirational question regarding where we choose to make our decisions from. 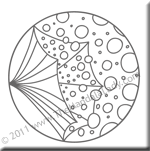 It will be fun to contemplate that with this mandala.